This weekend marks fall’s official kickoff, but unofficially, over the last two weeks, that cold bite has been here every morning, urging me to remain tucked within the snuggly folds of a warm bed. Oddly enough, San Francisco doesn’t have “seasons” in the traditional sense. In fact, if anything, fall is usually our summer, or as we call it, Indian Summer, but this September there’s definitely a nip in the air. Despite the chilliness today, the next few weeks are likely to bring us some scorchers. Of course, the weather hardly matters here as we roll into my favorite time of year. To celebrate the arrival of fall, the #SundaySupper crew is hosting an Autumn Apple Party, so in addition to my Harvest Rice, you’ll find links to a bushelful of apple recipes below. Did you know, apples were one of the first cultivated fruits and that there are more than 7,500 named varieties? Pass me a Pink Lady, please! For most varieties, the apples are harvested between August and October, so in many areas, as the apple selection ramps up at the market, we know fall is upon us. Of course, for those of us on the Left Coast, produce (and weather) doesn’t necessarily follow seasons, so here fall is more a state of mind. At least for me. In poetry, Autumn is expressed as a time of melancholy–the fun-filled days of summer are gone, the cold of winter is on the horizon. There may be some truth in that, but around here, fall, and as we head into winter, is filled with fond memories of family gatherings, the warmth of a bustling kitchen, the aroma of nutmeg and cinnamon wafting through the house, the sounds of football blaring from the TV in the background. I once flew clear across the country to experience the brilliant imagery associated with fall, which was impressive, but couldn’t match the cherished Autumn memories of the place I call home. Weather aside, this Harvest Rice recipe just feels like fall and is the result of making do with ingredients on hand one fall afternoon. My niece, Jen, was visiting for dinner, and as I was throwing this together, she wondered how I knew it would ultimately work out. I didn’t really, but sometimes cooking is about taking chances. Neither of us remember the main course that day–the rice was hands-down the star of that dinner. Nowadays, I think she’s become the better cook, and I’d like to think that I had a hand in that, possibly stemming from that fall afternoon in the kitchen. 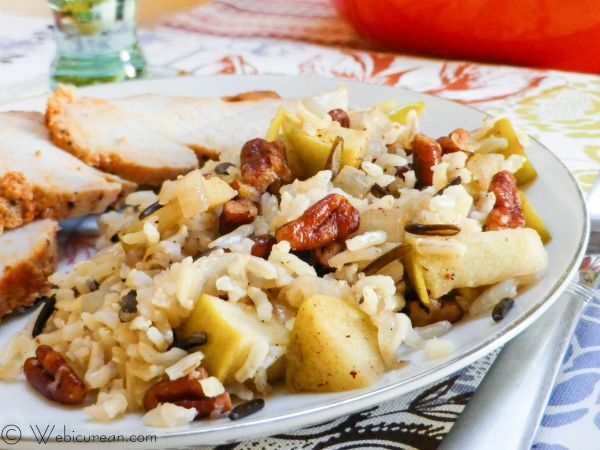 Fortunately the combination in this dish wasn’t a big stretch for the imagination–the slightly sweet/tart bite of the apple and the buttery crunch of the pecans blend in perfect harmony with the rice. It can be served warm, as a side with pork or chicken, but it’s also good chilled as a salad. Either way, it’ll be love at first bite. So, let’s dig in. We need but a few ingredients… gather them now! I used a Granny Smith apple for this recipe, but you’re welcome to try something sweeter if that’s your preference. Also, rather than chopping up the pecans, I started with a bag of bits & pieces. I know, it’s a cheat, but they’re actually a little less $$ and save the extra step of chopping. First, let’s get the chicken broth going. You’ll want to bring this to a boil before adding the rice, then cover and simmer for about 40 minutes or until the rice is done. While the rice is cooking, let’s work on the other ingredients. We can start by melting the butter in a non-stick skillet and toasting up those lovely pecan bits. Once the pecans are golden brown, remove from the pan and set aside. Meanwhile, chop up the onion and the apple. 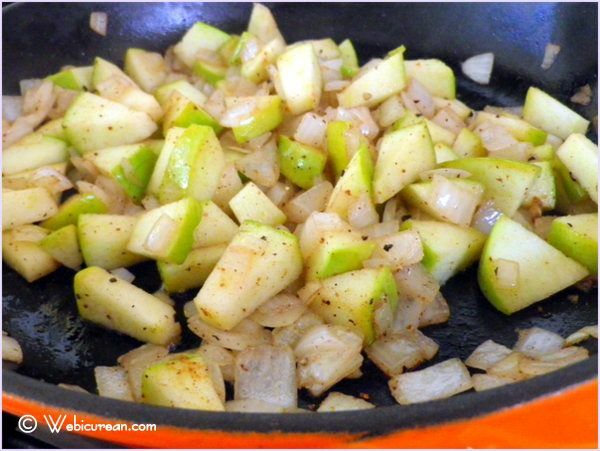 There should still be some butter in the pan you used for the pecans–add the olive oil to that pan, then sautÃ© the onions and apple until the onions are translucent. Sprinkle the nutmeg on here, as well as salt and freshly cracked pepper to taste. 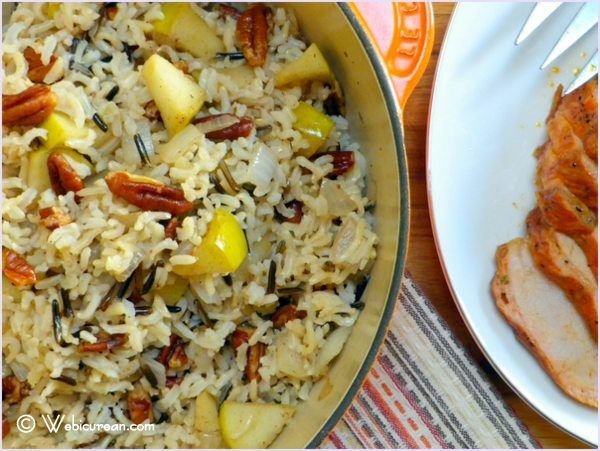 When the rice is done, toss in the apple mixture and pecans… then promptly serve yourself a generous portion… enjoy! 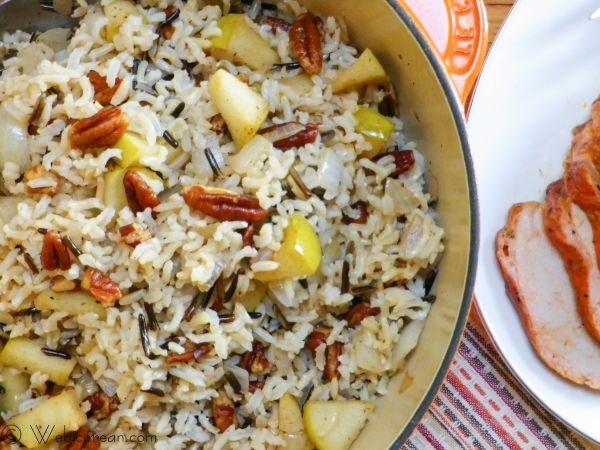 Harvest Rice is reminiscent of fall, with a mixture of brown and wild rice, tossed with tart apples and buttery toasted pecans. 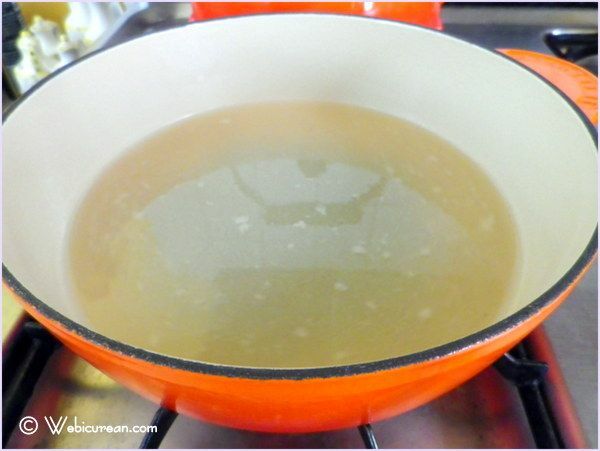 In a large pot, bring chicken broth to a boil. Add rice and salt and simmer for 40-45 minutes, or until done. In a non-stick skillet, melt the butter, then sautÃ© the pecans in the butter until the pecans are golden brown. 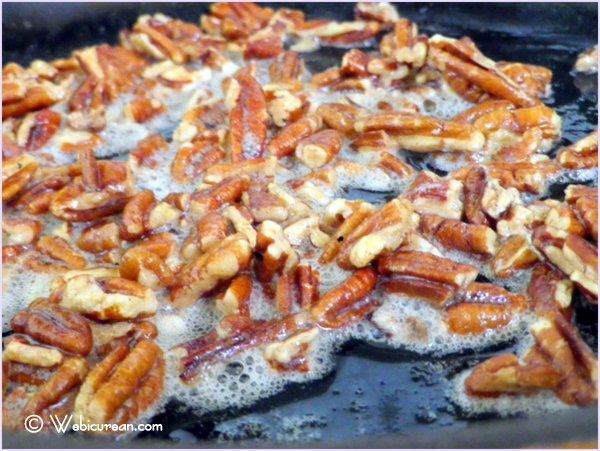 Remove pecans from the pan and set aside. 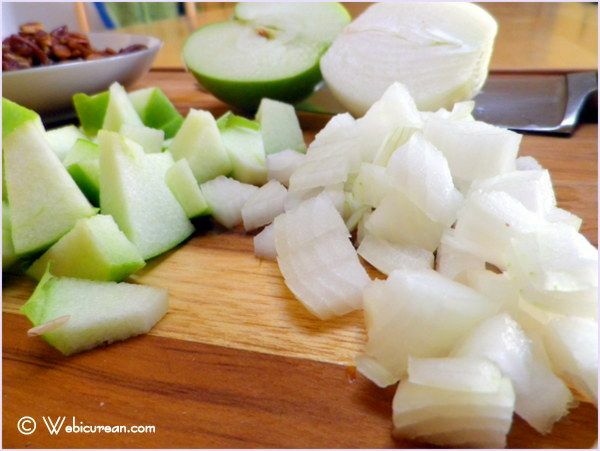 In the same pan, add the olive oil, and sautÃ© the chopped onion and apple until the onions are translucent. Sprinkle with nutmeg, salt and pepper. When the rice is done, stir in the apple/onion mixture as well as the pecans. Join us this week Around the Family Table for Sunday Supper. Â We have over 50 amazing recipes using apples to share with you. Â Do you have some favorite Autumn Apple Recipes to share? Â We would love for you to share your favorite apple recipes during ourÂ #SundaySupper live chatÂ at 7pm (Eastern). Double Apple Pot Pie- What Smells So Good? Please be sure you join us on Twitter throughout the day during #SundaySupper. Weâ€™ll be meeting up at 7:00 pmÂ (Eastern)Â for our weekly #SundaySupper live chat where weâ€™ll talk about our favorite apple recipes! 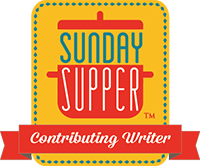 All you have to do is follow theÂ #SundaySupper hashtag, or you can follow us through TweetChat! Weâ€™d also love to feature your apple recipes on ourÂ #SundaySupper Pinterest boardÂ and share them with all of our followers! You are right cooking is all about taking chances, that is one of the things I love about it. Yes things don’t always turn out but you can discover the most amazing new things when you try. And your rice looks so scrumptious. Wow! This dish looks so good. I love sleeping with the windows open in the fall under a snuggly blanket. Happy #SS! Wow what a beautiful dish!!! Your photos are always so amazing! Love this recipe, adding it to my list. Pinned…because I need to make this now!!! Jen @JuanitasCocina recently posted..Apple Cinnamon Dessert Chimichangas ~ Autumn Apple Party for #SundaySupper! This is my kind of side dish. Yum! Kudos for being such a great aunt and encouraging your niece in the kitchen. I saw the first pic and ran to the kitchen to see if I had pecans and rice. IÂ´m so having this in a few hours for lunch! Love this recipe! Have a great sunday Anne! Wow…this looks SO GOOD! I made a fall fruited rice with pomegranate arils, nuts, and apples a couple of years ago…and I LOVED the sweet crunch of the apple in the rice. Saving this one…perfect with a roasted pork tenderloin. Whoa! You had me with those pecans in butter! Great dish! What a colorful rice dish. I love pecans and any excuse to add them to a dish is good for me. I can see this as a great side to go along with pork. Sounds wondeful Anne! Thanks for this yummy side dish for our Apple Party! Lovely fall photo! The recipe sounds like a wonderful accompaniment. I especially like the look of the pecans. I usually have this strange opposition to eating rice, but this looks amazing! I will have to try it! As soon as I saw that this could be served as a side dish OR as a cold salad… I was in love! I am always looking for dishes like this that I can take to work for lunch since I pull leftovers for my lunch just about every day! This looks really good! Perfect side dish for Thanksgiving. Thanks for sharing! This looks so good!! I love rice with apple & pecan. Great dish! 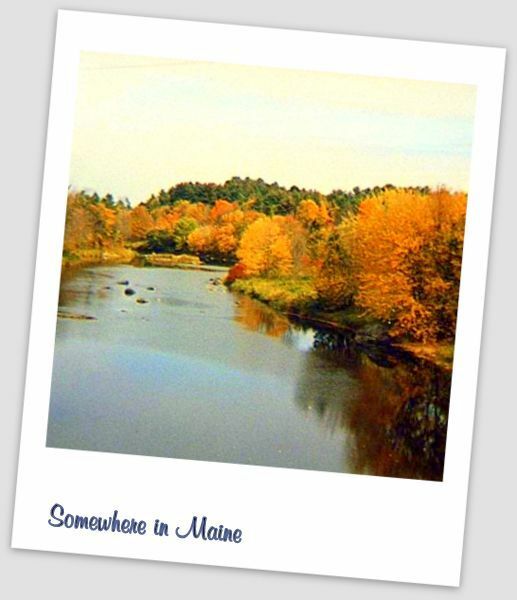 Conni @MrsMamaHen recently posted..Because I love Autumn…..#GiveAway! This looks so good I am going to have to try it. Hubby is away this week but it’s going to be on the menu soon!! What a great side dish. 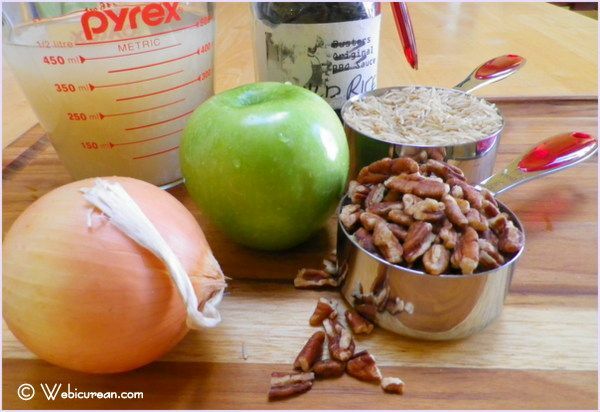 The apples and the onions, and the pecans all together just sounds incredible! This is a great rice recipe. Looks so satisfying and yummy. Lovely recipe, I’m a big Granny Smith fan, I just love their crisp tart taste and I bet it was great in the rice. Love new ways to use rice. Thanks for sharing. A creative way of cooking rice! Yummy! Thanks for sharing such a beautiful scenery picture of Fall…love it! Such a great way of using apples!I’ve never made rice with apples before and this surely is a must try :)Love it! This rice looks so gorgeous! I love it! seriously, it’s so pretty! I am definitely going to try this recipe, thank you! Alice @ Hip Foodie Mom recently posted..Applesauce Chocolate Chip Bundt Cake with Caramel Glaze . . . for #SundaySupper! Brown and wild rice with ANYTHING is a winner here! We’d have to leave out the nuts because of allergies but sunflower seeds would be divine too! That so awesome! Thanks for letting me know! The beauty about cooking is how you can experiment and not worry about exact measurements. Look at the amazing recipes you come up with when you just use your instincts! This rice sounds delicious – it’d be great as a stuffing too, I bet! Oh my that looks so good. I love rice so much. I can eat the whole pan without any protein. Thanks for sharing this wonderful version. I will serve myself a generous portion indeed. This looks like a great side dish. We love rice! Hezzi-D recently posted..Quick Bread Two Ways: Pumpkin Spice and Strawberry for What’s Baking? What a beautiful and interesting combination of flavours! This one is a keeper! Can’t wait to try this and I think a swap of the chicken broth with a vegetable broth will make this a great side dish for my vegetarian friends. And I agree..perfect for fall. I love rice dishes! This looks so good! Okay, just made this again and love it!!! Sounds delicious. Perfect for rice lovers like me. Thanks! This is a good one!